Our planet is gorgeous and generous! What kind of planet do you want to bestow upon your grandchildren in the future? Every action matters. Celebrate Earth Day on April 22nd with your family and take a stand to protect the Earth. Here are 11 playful activities that are sure to sustain the Earth and the laughter! Conquer carbon emissions while torching calories and enjoying fresh air! As a family, we try to bike everywhere we can to reduce driving time. Around the neighborhood, the local farmer's market, the playground, the museum downtown, and quaint little cafes are among our favorite places to peddle to. Where will your family bike to this Earth Day? More than just shade givers, trees are champions for clean air and healthy water! I was delighted to learn that a single tree produces enough oxygen to meet one family's annual needs, absorbs up to 330 pounds of carbon dioxide a year, and reduces erosion. So do your family and the planet a favor by planting a tree for Earth Day! Your kids will love picking out their leafy friend, caring for it, and observing the growth each month. You can also venture beyond your backyard and help beautify the neighborhood by planting in a park. With a milk carton, household items, and an afternoon, your family can craft a cute and functional bird feeder. Not only does it nourish those lovely feathered creatures, it provides delight and wonder to your family when they come to visit. My girls love to try drawing them when they stop by! Do you loathe to see litter as much as I do? Grab gloves, recycled trash bags, and a scavenger hunt list. Challenge your family to find both wacky and common items like a blue shirt, red can, and black candy wrapper as you clean up your neighborhood streets. You can also gather cans to raise change for local animal shelters! I've found everything from apples and yams to homemade beauty products at my local farmers' market. Not only do you uplift the local economy and reward the vendor's hard work, you stock your family's fridge with fresh produce! You can give your kids a grocery list so they can hunt down items. I also encourage mine to pick out a new fruit or vegetable to try each week. I hope to see you there! Most of us use electricity frequently, but I'm willing to turn off the lights on Earth Day. Why not make a game day out of it? Play flashlight tag, roast marshmallows and smores over a campfire, and tell bedtime stories by candlelight. You can also take your family stargazing and revel in the dazzling gems of the sky. Water conservation is one of the most essential steps you can take to protect our planet. Drop by drop, you can make it a lifestyle! Play in a local stream, design and set up a backyard rain barrel, or race to see who can take the shortest shower. These games all cut your family's water usage and conserve this precious resource. Many kids cling to beloved toys with an iron grip. They may be more eager to downsize if you make it fun! Offer perks for each item they donate, such as credit towards a new toy. Clothes, books, and sports equipment can also find a new life and home through donations. Not only does this save items from the landfill, it creates a cycle of compassion and sensibility. We're not all blessed with a sprawling garden or outdoor space, but that's OK! Maximize your deck and windowsills by using clay pots (never plastic!) to plant produce and blossoms. Not only will your kids love to sink their hands into the soil, they will be able to cultivate patience and nurturing skills as they tend to the cycle of growth. Americans throw away a third of the food they buy every year. While a bit of waste is inevitable, try to cut back and get the most bang for your buck! Challenge your kids to discover a recipe that will utilize leftovers in the fridge. You could also try composting, which will yield nourishment for that garden we discussed earlier! How many birds can you spot in your backyard or local park? Play I Spy to find a variety of birds. Snap pictures, read up at the local library (after biking there), and relish in the sweet songs of Springtime! 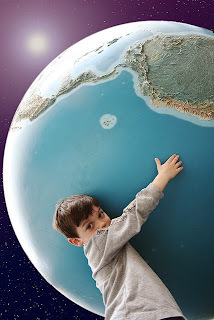 Are you ready to celebrate Earth Day as a family this year? I hope you explore some of these fun and educational ways to help the planet thrive for generations to come. Every little step matters!